Bed Bath and Beyond is one of the biggest retailers in the United States. They sell a wide range of items from furniture, home decoration items, bedding, and lighting to cookware. The Bed bath and Beyond wedding registry section has also been a big hit with people planning weddings. A lot of people like to use a Bed bath and Beyond coupon when they go shopping. The coupons are one of the reasons people just love this store. This website aims to bring you all the coupons, discounts and special promotions that this retailer has to offer. Below are a few things you need to know about their coupons. What coupons are available from Bed Bath and Beyond? BB&B offers many different types of coupons. They have the 20% off a single item coupon, $5 and $15 off coupons and the rare 20% off entire purchase coupon. The 20% off a single item Bed Bath and Beyond coupons are either sent to you through the mail or sent to you through the email as a printable coupon. When you receive the email version, you have to click on a link inside the email in order to print the coupon. This 20% off coupon can only be used at a brick-and-mortar BB&B store. You cannot redeem them online. The $5 and $15 off coupons are occasionally sent through the mail and are also always present in their circulars or flyers. They are great for use with small item purchases under $25. On rare occasions, some people do actually receive a 20% off entire purchase coupon. I am yet to find out how you can get hold of this coupon but I have seen them being sold on the internet. Where and how to get the BBB Coupons? Getting hold of a bed bath and beyond coupon is not very difficult. There are links on this page to places where you can easily obtain a coupon. Find below other ways to receive them. When you make your next trip to the BB&B store, speak to the clerk and find out if they have any coupons to give out. They typically do have a bunch of these and will give you some if you ask politely. They can also help you sign up for their circulars and flyers. 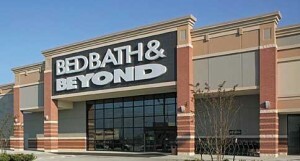 Visit the official website at bedbathandbeyond.com and sign up for their email newsletter. You generally receive an instant 20% off a single item printable coupon in your inbox. You should open this email, click on the link inside to go to the page that has the coupon and print it off there. Some people have been complaining that they don’t receive the email after signing up. On the most part, the email with the coupon is sent to you instantly. But on some rare occasion, this email can be delayed. Another reason you might not have receive the email is that, the message might have gotten caught in your spam folder. So do check in your spam folder after you sign up as the email might have been sent there. Another reason you might not have gotten the email is that you signed up with an email address you have already used in the past to sign up. If this is the case, use a different email address. There are people selling the 20% off one item and 20% off entire purchase coupons online. You can get them for about $1 from these sellers. 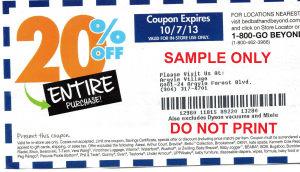 The 20% off a single item coupon sent through the mail or found in flyers can also only be redeemed in stores. They also do have an expiry date but some stores do however accept them after they have passed their expiry date. It is however dependent on the district or the store. You should call the store to find out what their policies are before visiting. Click here to find contact details for a store near you. You can only redeem one coupon per visit. And making multiple copies of coupons is not acceptable. One trick to redeeming more than one item is to either shop with friends or family and spread the items into different carts and have each person checkout independently or buy the item, checkout and come back to repeat the process. Does Bed Bath and Beyond accept manufacturer coupons? The answer to this question is yes. They will take manufacturer coupons under the condition that they are not expired, you redeem just one coupon per item and you use the coupon for the item is was intended for. Can I use coupons online? The answer here is “NO”. They are only made to be redeemed in their stores. But they do have a price matching service. If you see an item priced lower online than in their store, you can show this to them and the store will match the price for you. You cannot however apply a coupon to this. What if the item I want to purchase is only available online? In this case, you need to ask a beyond store associate to order the item for you. They can apply the coupon to the item when you come to pick it up from the store. Use the store finder I provided earlier in the article to find a store near you. Will they accept a competitors’ coupon? Yes. They will accept coupons from their competitors under the condition that the competitor store must carry the item in their store and that the coupon has not expired. In other words, you can’t redeem a Starbucks coupon when trying to buy a linen from BB&B because Starbucks do not sell linens. They do not offer promotional (promo) codes for redemption online. Instead of offering coupons and promo codes for online redemption, the company rather has special promotions and offers for their online store. When you join their email list, they will email these offers to you. The offers range from discounts on select items, clearance sales and free shipping. You can take the receipt back after you have made a purchase to redeem your coupon on your purchase. Ask the store clerk or manager if they allow this before you try it. Use your 20% off coupons for high value items. For smaller items, use the $5 off or the $15 off coupons. For items under $25, using this coupon can actually save you more than 50% or 75% off your order. Bed Bath and Beyond no longer accepts coupons from Linens-n-Things. Bed Bath and Beyond also has the 10% off a single item coupon. They are also either mailed out to you or found in flyers and circulars. They also have the $25 off $125 coupon which is basically a 20% off coupon. They are also distributed through flyers or can be picked up from the store during checkout. Bed Bath and Beyond is a very popular store and people love them. One reason for this is the availability of their coupons and the big 20% you can save on big ticket items. So don’t forget to print a bed bath and beyond coupon for your next visit to their store.